Mr. Mazzeo practices in the areas of intellectual property litigation, trademarks, copyrights and patent prosecution. He has litigated all types of intellectual property cases, including complex patent infringement cases involving multiple patents and trademark and copyright infringement cases, as well as complex business disputes. Mr. Mazzeo’s experience includes filing and defending actions in various federal and state courts and the Trademark Trial and Appeal Board of the U.S. Patent and Trademark Office (USPTO). Mr. Mazzeo also has filed and prosecuted well over a hundred trademark registration applications in the USPTO and in foreign trademark offices. Mr. Mazzeo also prepares and prosecutes patent applications in the mechanical and business method fields. He also counsels clients on patent and licensing matters. Mr. Mazzeo is very active in the Pennsylvania Bar Association’s Intellectual Property Section and is the current Section Chair. He also is a sought after presenter for seminars for attorneys on the subjects of patents and trademarks and has spoken to the general public about intellectual property on a radio show. 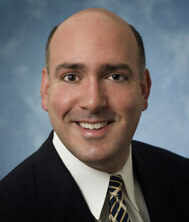 Mr. Mazzeo also is an instructor for the Licensing Executives Society. Prior to co-founding Ryder, Mazzeo and Konieczny, Mr. Mazzeo practiced in a Philadelphia patent boutique law firm. Mr. Mazzeo is proficient in the Italian language. - recipient of an American Jurisprudence Award. • Lehigh University, M.B.A, 1992. • Ursinus College, B.A., 1988. - Intellectual Property and Communication Section. - Co-founder of Chapter at Widener University School of Law.